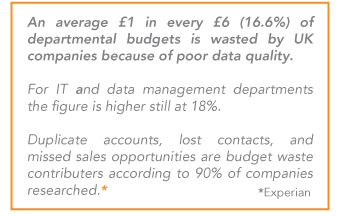 Since data is fundamental to so much that a modern organisation is and does, its management needs to be taken more seriously. Any system is only as good as the information put into it. Corpdata data enhancement and data cleansing services will ensure that your company does not waste valuable marketing resources as a result of using out of date customer information or using out-dated data to market to the wrong companies. By matching your in-house database to the Corpdata file, we can identify live records and update and enhance your records to include additional demographics and Preference Service flagging. Corpdata can also look at the patterns and trends throughout your customer database and pin point the profile of company or contact with the end result of enhancement, and cleansing of this to ensure you reach the contact most likely to buy from you, allowing you to make better use of your marketing spend. Ultimately using out of date or badly targeted information can be costly and damaging to your brand and reputation. Corpdata’s update, enhancement & analysis service enables your company to build and sustain brand awareness with your current and future clients.